We Honor All National Fleet Cards & Programs! True or false: Until your vehicle is out-of-warranty, it must be serviced by the new car dealer or the factory warranty will be void. It’s the law that independent repair shops can provide the services to maintain your new car warranty. 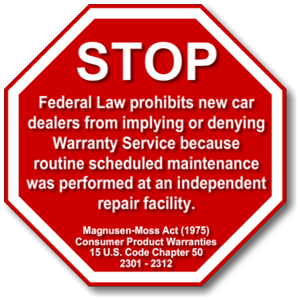 Consumers are protected by the Magnuson-Moss Warranty Act, enforced by the Federal Trade Commission (FTC), which prohibits a manufacturer from voiding the vehicle warranty because service was done by a non-dealer. For more information from the FTC about auto warranties and routine maintenance, visit: http://www.consumer.ftc.gov/articles/0138-auto-warranties-routine-maintenance. South Nampa Location Now Open!! 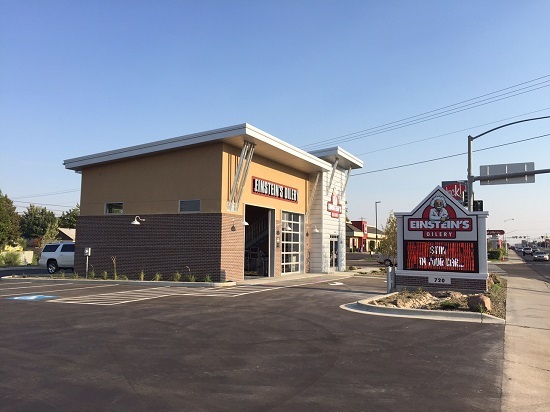 We are proud to announce that our South Nampa location on 12th Avenue (across from Nampa High School) is officially open for business! Our hours are Monday-Saturday 8am-7pm and Sunday 10am-5pm and no appointments are ever needed. You can reach the store at 208-546-0412. We look forward to serving you in South Nampa! 1. Drive smoothly: Avoid heavy acceleration or braking. Speeding, rapid acceleration and braking can lower your gasoline mileage by 5 percent at lower speeds around town and by 33 percent at highway speeds. 2. Keep your engine healthy: Make sure you get regular check-ups! If your car has failed an emissions test or something is noticeably wrong, repairing the problem immediately could improve your gasoline mileage by 4 percent, on average. 3. Make sure your tires are not over- or under-inflated: Proper air pressure cuts down on fuel consumption while driving. Keeping tires at the correct pressure can improve your gasoline mileage by more than 3 percent. 4. Minimize the weight of your vehicle: Keep your trunk and back seat clear of unnecessary items that add weight. Removing excess weight can improve your gasoline mileage. 5. Use the recommended grade of oil in your engine: Following your manufacturer’s motor oil recommendation can improve gasoline mileage by up to 2 percent. Look for motor oil that says “Energy Conserving” on the API performance symbol to ensure it contains friction-reducing additives. 6. Choose a high-quality gasoline: Top automakers say carbon deposits can build up on critical engine parts, which can decrease the power, performance and fuel efficiency of your vehicle. Audi, BMW, General Motors, Honda, Toyota, and Volkswagen recommend using Top Tier Detergent Gasoline to help keep engines clean. 7. Use cruise control: Maintaining a constant speed can improve gasoline mileage. Set cruise control and enjoy the open road in free-flowing traffic. 8. Avoid idling: When your vehicle is stopped while running, you get 0 miles per gallon. Turning off your car when you know you are going to be stopped for a lengthy period of time will save gasoline versus putting it in park. 9. Keep your speed down: Gasoline mileage usually decreases when driving at speeds over 60 miles per hour. 10. Plan ahead: Combine your errands for the day into one outing to avoid short, separate trips. This helps avoid unnecessary cold starts and keeps your car’s engine warm and running more efficiently.